“We’re hoping it will act as a catalyst” for future development of Laurier Blvd, says Gilchrist, who was speaking at the recent Quebec City Real Estate Forum. Gensler, which has been tapped by Dallaire to build Le Phare, describes itself as the world’s largest architectural firm, with 5,500 employees in 13 countries. Le Phare (phare means lighthouse) would be built on the site of the former Hôtel Gouverneurs which was demolished in 2014. The area of the Sainte Foy-Sillery-Cap Rouge borough serves as the western entrance to Quebec City. Aside from the main tower, the 2.7 million-square-foot project would include three other towers of 591, 361 and 197 feet. Construction would extend over a 10-year period. The first version of Le Phare was unveiled in 2015 and an updated version was made public in 2016. Public hearings on the project were slated for last year, but with the municipal elections approaching, Quebec City mayor Régis Labeaume announced in May 2017 the consultations would be put on hold. A new date for public hearings has not been set. While Quebec City officials have spoken positively about the project, it has yet to receive the official go-ahead. Le Phare requires zoning changes – building limits in the area are currently set at 29 storeys – and concerns have been expressed about the traffic congestion the project would cause on Laurier Blvd. Speaking at another session at the Quebec City forum, Cominar REIT (CUF-UN-T) CEO Sylvain Cossette defended the influx of office space Le Phare would create in Quebec City. Le Phare will be an live, work, play project that includes office, commercial, residential and hotel space, says Rosanne Dubé, architect and project manager at Gensler’s Montreal office. It will be centred by a public square containing a skating rink in winter and fountain in summer similar to New York City’s Rockefeller Center. To help keep the site lively in the evenings and on weekends, there will be a 750-seat multimedia concert hall. “What we’re trying to do is create a sense of place with Le Phare,” Gilchrist says. Plans call for an observation deck on the top two floors of the 65-storey building that will provide a 360-degree panoramic view and a restaurant on the top floor. There will be a residential tower for senior citizens, condos, rental units and a 150-room hotel. Le Phare would be on the path of Quebec City’s proposed new tramway system, which would run along Laurier Blvd. Since Quebec City is a low-rise city for the most part, Le Phare is “going to be a big deal in Quebec” and a big deal in Canada, says Gilchrist. The main tower of Le Phare will be identifiable from anywhere in the city, he says. Groupe Dallaire has been involved for 30 years with the development of the Laurier Blvd. business area. The company owns more than 153 million square feet of land in the Quebec City area and is one of the largest owner-developers in the city. 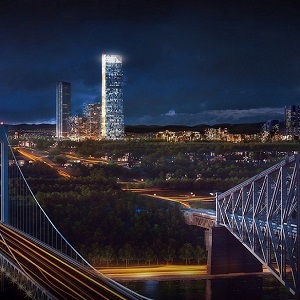 Among its other planned projects in Quebec’s capital, is a major residential project in South Shore Lévis and the Espace d’innovation Chauveau, a new industrial park east of Autoroute Henri IV.